Money Back Guarantee: Although, MilesWeb ensures you get top-level of web hosting services, in any case or due to any reason if you are not completely satisfied with their services, you can claim for the refund. You can opt-in for a refund within the first 30 days of your purchase with MilesWeb. Customer Support: MilesWeb has an in-house technical support team, which is well-qualified and well-trained. They are extremely friendly and have hands-on server and web hosting industry. Their customer service operates round the clock to help you resolve your issues. They are available 24/7/365 on phone, live chat and email. Uptime Guarantee: Your website is MilesWeb’s highest priority and thus, they strive for helping your website run smoothly round the clock. Their tier-3 and tier-4 datacenters ensure your website is uninterrupted and running well. As a result, they can guarantee an uptime of 99.95% to their customers. Jetpack is an all in one WordPress plugin created by ‘Automattic’. You get a variety of free tools and themes with Jetpack that help in fully customizing your WordPress site. It is a complete toolkit by WordPress which can help you with marketing, security and hassle-free designing of your website. Jetpack gives you abundant features like malware scanning, auto social sharing, spam filter, auto updates and a few more. With MilesWeb, you just pay for their WordPress hosting plan, while you get all these Jetpack features at no additional price. An SSL certificate encrypts all the data that is transmitted between the visitor’s browser and the web server. The sensitive data such as login credentials, credit/debit card details or other online transaction details will be kept completely secured by an SSL. With the recent focus of Google to make the internet a secure place for everyone, people have started adopting HTTPS extensively. With MilesWeb WordPress hosting plan, you don’t need to buy an SSL separately to keep your site secure, because their plan comes incorporated with SSL certificate for Free. Installing automatic updates is no more a struggle, because with MilesWeb WordPress hosting you get automatic updates on your WordPress platform. The software at the backend automatically installs all the recent updates with its latest version. The technical professionals at MilesWeb keep a watch whether your WordPress plugin is updated on time. You don’t need to manually install WordPress platform on your server. Once you buy WordPress hosting from MilesWeb, your server will come with a pre-installed WordPress, so that you don’t have to manually install or upload any software on your platform. This WordPress is pre-installed with the latest version and you are all set to launch your website as soon as you have opted for their WordPress plans. SSD disk serves a better performance than traditional hard drives. The memory on SSD disk is stored with flash memory mechanism. They have no moving parts and therefore making the performance much faster. MilesWeb servers are enhanced with these SSDs to increase your website performance and give your visitors amazing experience. The very basic plan of MilesWeb- Ace starts just at Rs.69 per month. You can host your WordPress website with 1 GB of SSD storage, with free Jetpack featured and free SSL. This plan is most suitable for simple basic websites such as hobby sites. If you are a startup or an SME, you can go with the ‘Heart’ plan of MilesWeb. The price of this plan is Rs.270 per month. You get 5 GB of disk space, 10 email accounts and free SSL, with Jetpack free features. 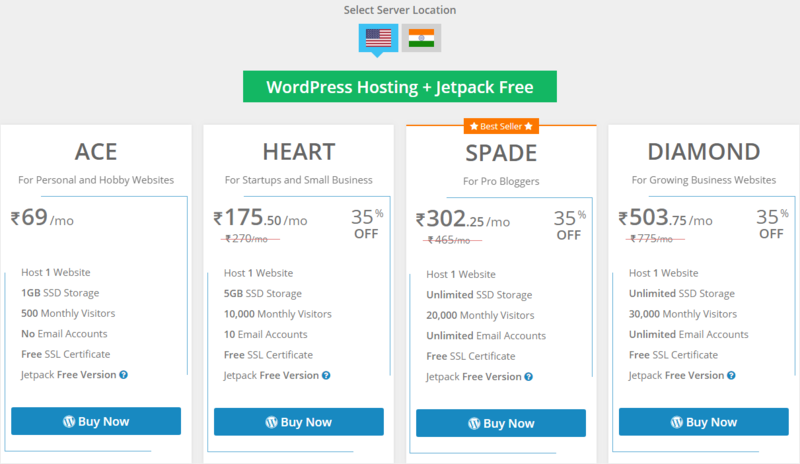 Presently, MilesWeb is offering a discount of 35% on their WordPress hosting plans- the Heart, Spade and Diamond. After discount, you can get the Heart plan just at Rs.175 per month. The Spade plan of MilesWeb is specially designed for professional bloggers. You get unlimited storage, unlimited email accounts, Free SSL and free features of Jetpack at the price of 465/mo. After the current discount, you can avail this plan at Rs.302/mo. The Diamond plan is mostly suitable for growing business websites, the price of this plan is Rs.775/mo. The discounted price of this plan would be Rs.503/mo. You get all the features same as Spade plan, in addition to support for huge number of visitors on your website. 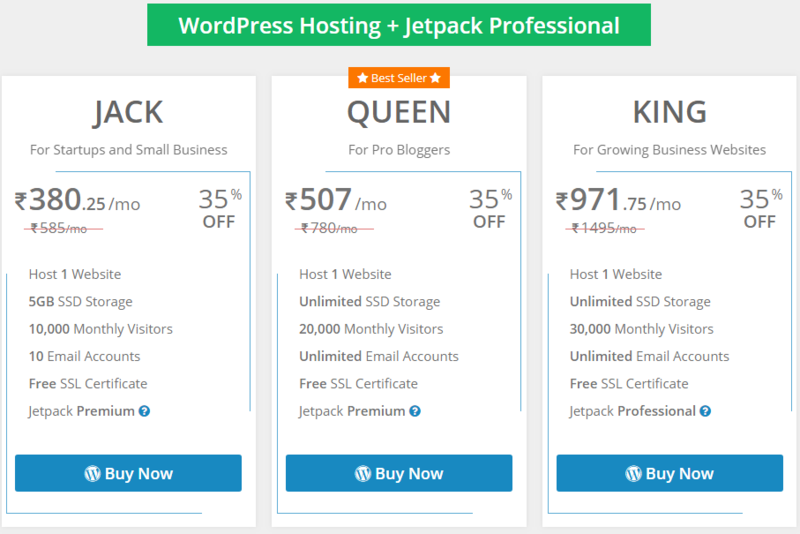 If you are looking for Jetpack Premium and Professional features with your WordPress hosting, then you may consider Jack, Queen or King plans of MilesWeb. You will get Premium Jetpack features with Jack and Queen plan whereas, the King plan has Professional features with its plan. All these 3 plans have a discount of 35%. The other features that these plans include are same as Heart, Spade and Diamond respectively. Please note- MilesWeb has different prices for different server locations (India, US, for their WordPress hosting plans. 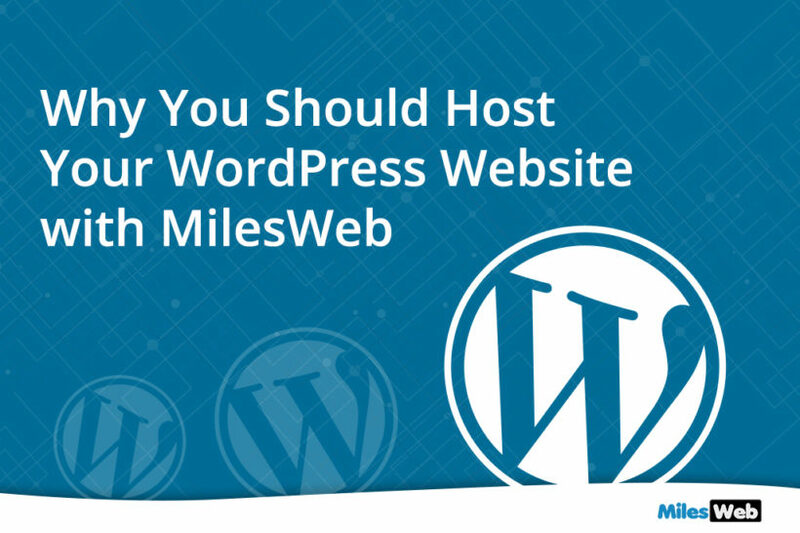 This was an overview of why MilesWeb is different than other WordPress hosting provider and why you should opt for their services. The feature that makes them stand out is ‘Jetpack’ and they are the first strategic partners of Jetpack in India.